In August 1916, the Germans were not doing well in the skies above the Somme. The Royal Flying Corps was carrying out its reconnaissance missions far too easily. One solution was to create the Jagdstaffel, a new type of formation whose sole purpose was to be a fighter squadron. One of the most successful was Jasta 2. It was lead by Oswald Boelcke, Germany’s premier ace at the time and a superb aerial tactician. He became the mentor for many of the country’s rising stars with names such as Richthofen, Böhme, and Kirmaier coming under his tutelage. After Boelcke was tragically killed in late 1916, the Jagdstaffel was renamed in his honour. It finished the war with 336 victories, second only to Manfred von Richthofen’s Jasta 11. 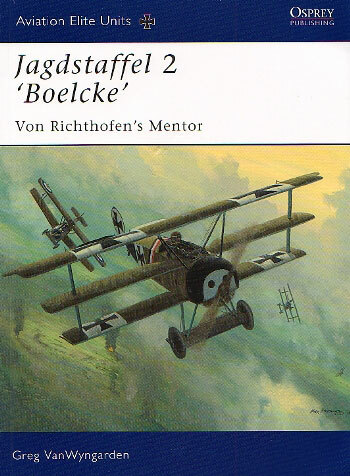 This book looks at the achievements of this unit as well as the tactics and personalities that made Jasta Boelcke one of the finest squadrons in the German Air Service. To do this, Greg VanWyngarden has amassed over 120 black and white period photographs. Many will be new to the ardent reader and all have been carefully selected for their relevance. The captions that accompany these are excellent, and compliment the text very well. Within the 128 pages are 36 colour profiles from the redoubtable Harry Dempsey. His passion for German aircraft is clearly evident as he meticulously documents the aircraft in question and provides additional plan views where necessary. Inevitably there is repetition with some subjects having turned up in previous volumes. These have been kept to a minimum and those that are familiar have been tweaked to provide an improved version. The author’s writing style makes the book a pleasure to read. Events are covered in chronological order, and the smattering of personal narratives from the participants adds a sense of drama to the proceedings. A useful appendix rounds out this edition which tabulates all of the commanders, as well as the aces that served with Jasta Boelcke. Selected serial numbered aircraft from the unit come in for some extra notes and a comprehensive index makes looking up both pilots and aircraft a breeze. This is another excellent book in the ever expanding range of World War One unit histories. There’s a wealth of information contained within the soft covered publication. The highs and lows of this famous Jagdstaffel are faithfully portrayed and the accomplished artwork provides a visual feast for the aviation modeler.